Blanche Hermine is a white wheat beer created in 1997 by the Lancelot brewery, inspired by the white hermine to craft the perfect whiteness of its beer. 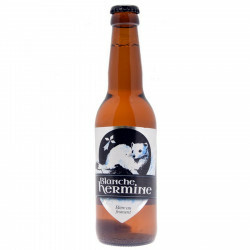 Blanche Hermine is a white wheat beer created in 1997 by the Lancelot brewery, inspired with the white hermine to craft the perfect whiteness of its beer. Blanche Hermine is also the name of a song sung by poet and singer Gilles Servat. est aussi le titre d'une chanson du chanteur et poète Gilles Servat. This is a light and low-acohol beer. Serve chilled. Serve chilled in a tall and narrow glass, for the perfect refreshing drink.